The Chairman of The Byways & Bridleways Trust has been awarded an MBE for voluntary services to the environment in the Birthday Honours. Mrs Cook plays a full part in the family dairy farm, while also working passionately to establish and protect the public right of access to our minor highways. Mrs Cook’s courage and tenacity when up against barristers at Public Inquiries where public rights are disputed has at last been acknowledged. 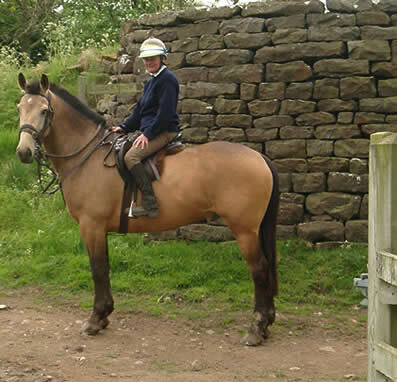 A keen and intrepid horsewoman who can seek justice for all who may legally and responsibly use our national heritage of byways and bridleways. This work is for the long term, so that our children’s children may enjoy access to the countryside on those same heritage routes as used by our forefathers. The list of additional routes is impressive and includes several Byways, half a dozen Restricted Byways and in excess of twenty-five bridleways. But this is only part of it, as there are may applications made to remove public rights from the record and it is countering these applications that Mrs Cook has excelled. Obviously there are still many Definitive Map Modification Orders that aim to divert or delete public rights in the pipeline and these create the future workload. The work to protect and extend the network of old lanes and public highways is never ending and the BBT are seeking new blood to carry on this vital work. Please see www.bbtrust.org.uk and detailed vacant volunteer posts advertised on www.reachskills.org.uk, but all offers of help gratefully received.